1m 3.5mm, male / male audio cable, 1 x 3.5mm male airline jack adaptor, and 1 x 3.5mm male double jack adaptor. Echrcamp, have you been to poundland today per chance? OK, I don't get out much from my cardboard box. I have to make the most of it, when I do. If its a bargain, share it, let the rest of the community know, thats what we are here for. I've bought this before. The Audio Cable and the Audio splitter jack didn't work. It's cheap but you have to try your luck.Most often than not the items does not work. I've bought this before. 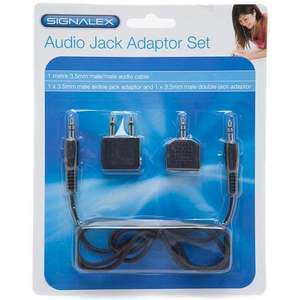 The Audio Cable and the Audio splitter jack … I've bought this before. The Audio Cable and the Audio splitter jack didn't work. It's cheap but you have to try your luck.Most often than not the items does not work. Nope, no luck, you can get your money back. 2. Fit for the purpose sold. I fought a lot of court cases for people on these 3 points, and never lost any of them. Before I was relegated to a cardboard box. Excellent little cable for a quid!